I've been on a stictly vegan diet for the past three-and-a-half days. This followed on the heels of a horrible reaction to whatever I ate on Thursday. Perhaps it was the abundance of pickled herring. Maybe it was my body rejecting the celebration of excess in Jen's absence. Serves me right for having a single beer. I need to know my limits. Speaking of beer, I decided to start the night off with my first beer since the ugly ordeal. 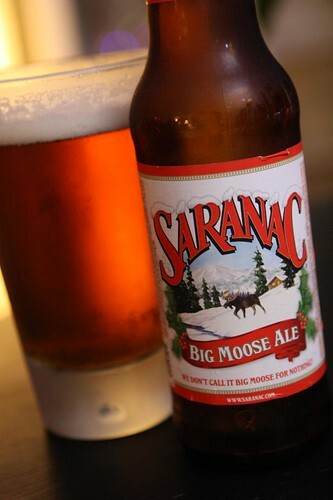 I selected this Big Moose Ale from Saranac Brewery. The label states: "We don't call it Big Moose for nothing!" I'm not really sure what that is supposed to mean but the beer is pretty good. It's an American Pale ale with a nice hoppy flavor from being dry hopped. It's similar to other winter seasonals, most notably, Sierra Nevada's annual Celebration brew. This one, however, features a festive moose tearing across the tundra. +1 for Big Moose Ale. At the farmer's market yesterday Jen spotted some cauliflower and had a sudden craving for a cauliflower soup. I obliged this evening by making this cream of cauliflower soup with rendered bacon, butter, garlic, onion, cauliflower, turkey stock, salt, and pepper. 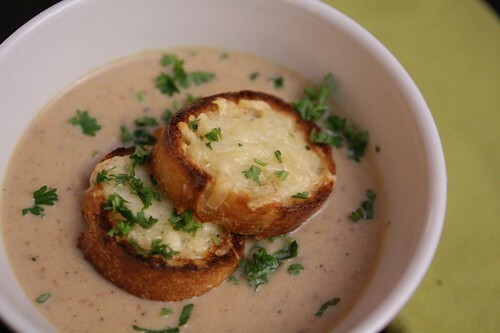 I pulsed it in the food processor and served it up with some Gruyere cheese toasts made on slices of fresh baguette. This soup marked a very nice return to the world of dairy. Jen's idea was a good one and, so far, I haven't become supremely ill. If I do have a reaction to this then clearly I'm just not cut out to eat meat or dairy anymore and I will return to a diet of thrice-a-day miso soup.